I do love a bowl of soup in the winter. It’s the perfect comfort food. Warming, nutritious and delicious, it’s a great big hug in a bowl. 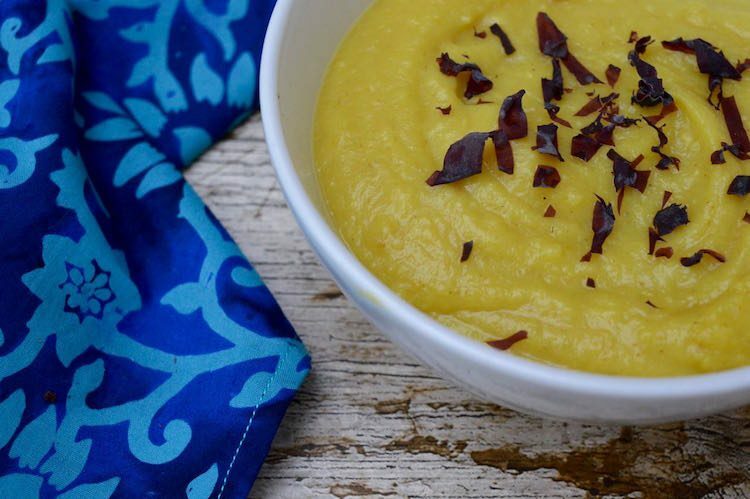 This vegan apple parsnip soup is one of my favourites. It’s lightly spiced, but the real flavour comes from the sweet aromatic parsnips offset by the slight tartness of the apple. Parsnips are a root vegetable related to carrots, parsley and dill and are a good British winter standby. They’re best picked after the first frosts. The starches turn to sugar resulting in a sweet and almost creamy vegetable. They’re a good source of dietary fibre, vitamin C, potassium and folate. I’ve found them tricky to grow, but we’ve produced some splendid specimens from time to time. With nowhere to grow vegetables this last year, I was really pleased when CT bought a freshly harvested bagful home from work the other day. Apple parsnip soup it had to be. Spices are an absolute must in parsnip soup, I reckon. They act as an excellent foil to the sweetness of the parsnips. 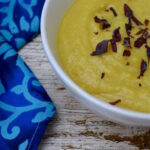 However for this apple parsnip soup I went easy on them, adding a lump of ginger, turmeric and just a bit of curry powder. As well as its well documented beneficial effects, turmeric gives a lovely golden hue to the soup, which makes it even more appealing. This spiced parsnip spinach soup is also delicious and a good way to get your greens, but the colour doesn’t seem quite right for parsnip soup, somehow. This apple parsnip soup is full of goodness and flavour. it’s also particularly thick. Quite frankly, this is just what I want in the middle of winter. It almost stands up as a vegetable puree you could use as a side dish. However, if you prefer your soups a little thinner, just add more water and maybe a little extra tamari or salt. I use organic veg so I can keep the peel on. This means I can give myself a smug pat on the back for getting even more of those essential nutrients into my body AND I don’t have to faff around with a veg peeler. With a good blender, you won’t even notice the peel. If you’re not vegan or particularly bothered about the soup being dairy-free, you could use butter rather than oil for a slightly richer flavour. A little seaweed scattered over the top adds a bit of colour, texture and extra nutrition. This amount serves eight as a starter or four as a main. As a Froothie ambassador I often get to try out some of their latest equipment. This time it’s the Optimum VAC2 Air Vacuum Blender. I’ve put it through its paces and it’s one very powerful machine. It blends smoothies and fruit and veg in a vacuum, if desired. This method is said to retain more of the nutrients as they are not oxidised in the process of blending. I’ve certainly found the colour of my smoothies stays fresher for longer. More of this in an upcoming review. The VAC2 can also make soups from scratch using veg that doesn’t require actual cooking. Parsnips are much better cooked than not in my opinion, so I just used the blender to whizz my ready cooked apple parsnip soup into a super smooth consistency. If you’d like to order an Optimum VAC2 Air Vacuum Blender, it’s currently on offer at £399. Order it or any other Froothie appliance through either of these links and I can offer Tin and Thyme readers free P&P. Just add 2483 free ambassador delivery to the comment box when ordering. If you order by phone, just mention the code. The delivery charge will be credited back onto your card. A nutritious, flavoursome and colourful soup which provides a warming winter hug in a bowl. 2 tbsp lightly flavoured oil - I used rice oil but rapeseed or sunflower would be good too. In a large pan, fry the onion and garlic in the oil over a low heat for about 10 minutes or until the onion is soft and translucent. Roughly chop the parsnips and add to the pan. Stir. Roughly chop the potatoes. Add to the pan and stir. Cover the pan with the lid and cook for about 5 minutes. Add all the remaining ingredients. Bring to the boil, then simmer for 15 minutes. Blitz with a stick blender, food processor or jug blender. I used my new Optimum VAC2 Air Vacuum Blender. Scatter a little dried seaweed over the top before serving if liked. If the soup is too thick, just add additional water. You may need a little extra tamari or salt to compensate. I’m sharing my apple parsnip soup with Recipes Made Easy for #CookBlogShare. The recipe, being dairy-free and vegan also goes to Free From Farmhouse for #FreeFromFridays. Apple Parsnip Soup. PIN IT. It’s a lovely combination and has been a firm favourite of mine for many years. I made something similar a few weeks ago. It’s a lovely combination of flavours and your soup looks delicious. Thanks Janice. It’s hard to beat a bowl of thick creamy soup at this time of year. And parsnips make a good one. Apple and parsnip really do go well together and I can imagine that this soup is delicious. Thanks for linking to my parsnip cakes. Thanks Mandy, it’s a good combination. And your parsnip cakes sound fabulous. I absolutely love soup too! I make a carrot, parsnip and ginger soup every week, and yours sounds like something we’d all love. That will be for next time we have lots of parsnips. Your new blender sounds fab, with the vacuum function. Thanks for joining in with #FreeFromFridays. Your ginger soup sounds splendid too. I do love a bowl of soup in winter especially, though I’m not averse to eating it all year round. So creamy and comforting! I love the combo of parsnip and apple! Yes it’s a classic and a firm favourite with us. Ah I’ve heard about the vacuum blenders, will look forward to your review. I agree that spices marry so well with parsnips, your soup looks so delicious! Aw thanks Kavey. I can’t get enough of soup at this time of year. The vacuum blender is by no means a pre-requisite for this type of soup, but it does blend rather beautifully. I love the flavour combination of this soup. Thank you for sharing on #CookBlogShare. Thanks Jacqui, it is indeed a good one. This is one of our favourite soups. It has a nice touch of sweetness and a good way to use up parsnips. Yes, I totally agree Dannii. It also makes for a nice smooth texture. “Spices are an absolute must in parsnip soup, I reckon” I agree, as I don’t really like parsnips (although I’ll have a tiny bit of roasted parsnip at Christmas for tradition’s sake) but I love spicy parsnip soup. It’s funny how we can eat some foods a certain way and not others. Spice helps with a lot of things. Not sure I’d be too happy if you put this in front of me when I was expecting dessert 😉 It was delicious though.